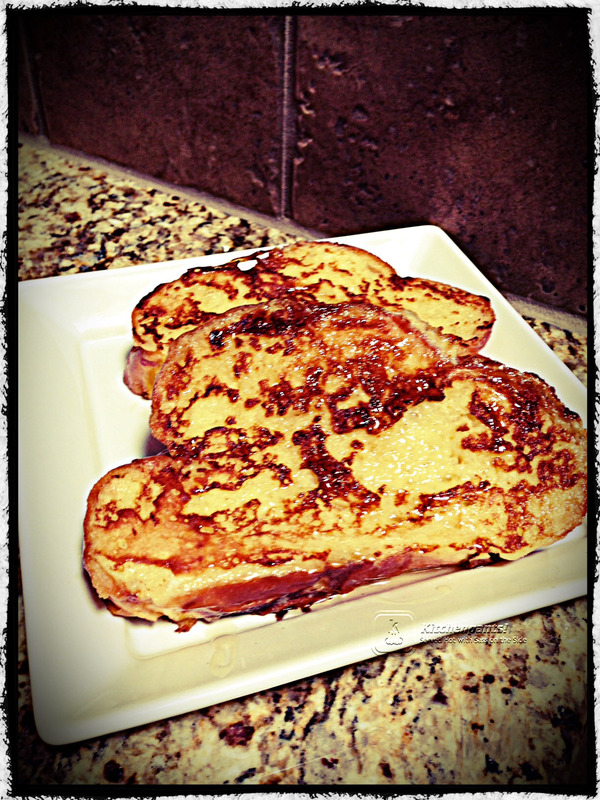 Orange Honey French Toast | Kitchenpants! I don’t even have a good story about French Toast. I don’t ever order it in restaurants and if you do order it, I’m probably not going to ask for a bite. Nothing against French Toast, but I am partial to my egg whites and rye toast. The resident littles love saying “Let’s make some FRAAAAANNNNNNCH TOOOOOAAAAST!” It is really cute when they do it, although one of these days I am going to have to explain to them the origins of the expression so that they refrain from saying it outside the house. While I figure that out, here’s my recipe for Orange Honey FRAAAANNNCH TOOOAAAST. 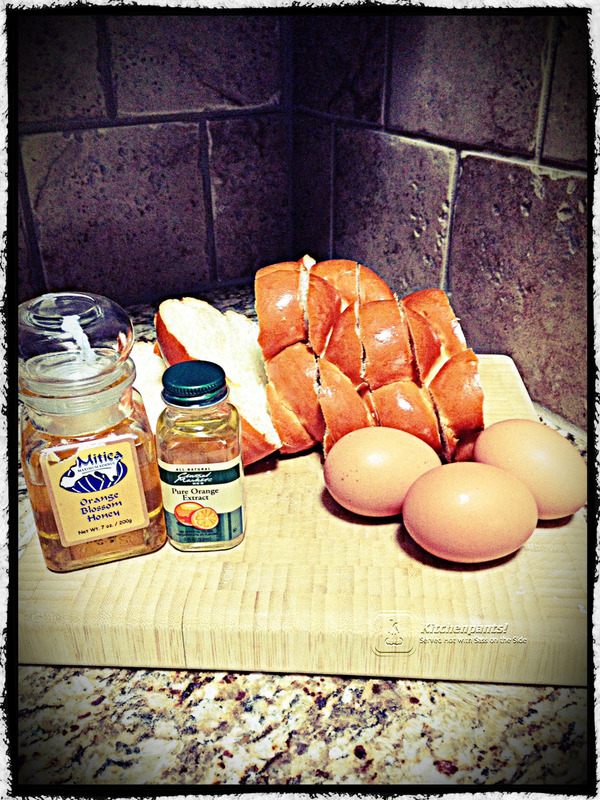 A Loaf of Challah Bread – Say “HA-LA” or “HOLLA!” if you’re gangsta…(threw that in for you, Emily!) This is a delicious Jewish eggy-sweet bread. Eggs – The number of eggs you will need depends on the number of slices that you are going to make. Generally, I use three egg whites to one egg yolk in my French Toast because I just don’t like egg yolks, but as always you can do as you wish. Generally speaking, you will need at least 5-6 eggs for a loaf and more if you cut the yolks. Pure Orange Extract – This is magical stuff. You will need about 1/2 tsp for each egg that you use in this recipe. Butter – Don’t use oil or cooking spray. You will need about a 1/2-3/4 inch pat (about a tbsp) to start. Use your judgment. Honey – Use whatever kind you like. I have an Orange Honey by Mitica that I love, but you can use what you like. Slice the Challah into 1-inch slices and let it sit out for 20 minutes or so. I don’t use stale or hardened bread when I make French Toast, but I will let the bread dry out just a bit. Crack the eggs into a bowl. Use your judgment as to how many eggs you want to begin with. Challah does soak up quite a bit of the egg batter so I would start with more than you think you will need. Mix up the eggs with your fork or whisk. Add 1/2 tsp. of Orange Extract for each egg that you have used. Mix and smell: Can you smell the orange? You must be able to smell the orange in the egg batter if you expect to taste it in the toast. Add more extract as needed until you are satisfied with the smell. Heat the griddle over medium-high heat and melt the butter in the griddle. How much butter you use will vary depending on the size of your pan and the size of the batch you will cook at one time. Make sure you melt enough to really interact with the egg, but not so much that you have greasy toast. I find that 1/2 tbsp. 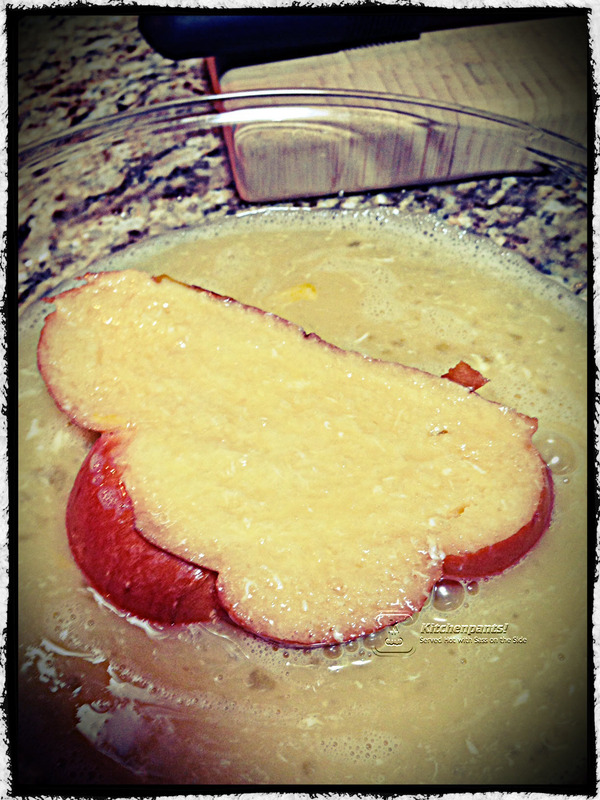 is a good starting point for two pieces of French Toast. Dip a piece of bread in the egg batter and let it soak for 15 seconds or so. Make sure that both sides are coated. Drop each slice on the pan and cook until one side is golden brown and then flip. Cook until the other side is golden brown as well. Remove from the heat and continue to cook the other slices the same way: dip, soak, drop, flip, done. To serve, plate the bread and drizzle with honey. Enjoy! Over here we call this Eggy Bread (well go figure) or Gypsy Toast (no idea) but this is without doubt the most decandent version i’ve seen – delicious! I hope you try it! Where is “over here”? Sorry that would be London, lovely freezing cold London! Yikes! Texas is beautiful this time of year.